View cart “memories body oil travel size” has been added to your cart. Linden Leaves Aromatherapy Synergy range has been specially formulated to firm, tone and strengthen the skin whilst reducing scarring, stretch marks, wrinkles and fine lines. Linden Leaves’ body care range features freeze dried New Zealand flora bathed in organic plant oils. The key active ingredients – organic avocado oil and vitamin E – have been carefully selected for their vitamin and antioxidant properties. These key ingredients give the Aromatherapy Synergy range the ability to support healthy collagen development and protect the skin from free radical damage. A luxurious blend of rose, geranium and ylang ylang. A mellow blend of lavender, sandalwood, cedarwood and orange. 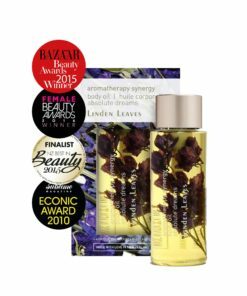 A rejuvenating blend of mandarin, petitgrain, rosemary and lavender. A sensual blend of neroli, vanilla and sandalwood.